With another summer comes another Wilderness Trace Barn Bash, and this year's was a hoot! On Saturday, July 12, the Wilderness Trace KFTC chapter hosted its second annual Barn Bash at Woodwind Farm in Junction City, where the music, weather, food, and company all made for a great combination to celebrate KFTC's work over the past year and to invite others to join in the fun of working for social change. People who came hungry were delighted to find a great assortment of dishes. Local food was front-and-center as all the meat at this year's event came from nearby Springfield producers, Rising Sons Beef and River Run Farm & Pottery. Providing quality local food at a low price to Barn Bash guests was made possible in large part to event sponsor, Stuart Powell. Members felt that showcasing local food fit in well with the chapter's values and hope to continue grilling local meat at future events. 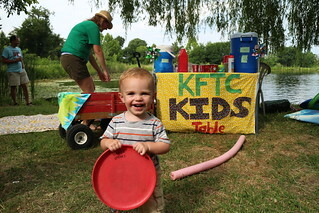 While people chowed down, they got to enjoy hearing two local KFTC members share their story. Jane Brantley spoke to the crowd, sharing that she first became involved 4 years ago because of her interest in ending destructive mining practices and has marched mutliple times in Frankfort on I Love Mountains Day. Other issues started to speak to Jane, too, and she helped lead the effort to pass a local LGBT anti-discrimination ordinance in Danville. On June 9, Danville became the 7th city in Kentucky to pass a Fairness ordinance. Applauding the work of other chapter members, Jane said, "Throughout the long process, members of the Wilderness Trace KFTC Chapter provided support and encouragement. When opportunities arose to help move the development of the ordinance forward, KFTC members attended City Commission meetings and many spoke eloquently in favor of Fairness." Jane ended with a call for people to join KFTC, saying, "By becoming a member of KFTC, you make your voice stronger by joining with others who share your convictions...Let's continue to work together to move Kentucky forward!" 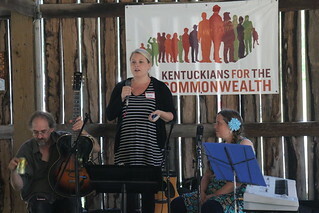 Sarah Berry joined KFTC earlier this year after engaging more in Fairness work in Danville. "I had no clue an organization like this existed," said Sarah. "I looked at KFTC's website and joined 5 seconds later." She shared that she was surprised to find an organization where people involved wanted to take the time to get to know you personally and how much that meant to her. Sarah also encouraged people to become members, saying, "You can make a positive impact in your community. You can make your state better." 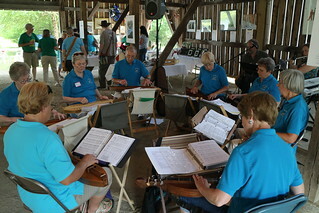 Great music filled the barn throughout the evening as the Danville Dulcimers welcomed people early-on and, later Lexington musicians Art Mize and Diane Timmons played swing jazz music. While taking in the sounds, people spent tme perusing and bidding on items in the silent auction, which included a wide range of items. From restaurant certificates to large artwork to everything in-between, the silent auction was accessible to everyone and provided a fun way for people to contribute. In the end, the Barn Bash proved to be a great success in its second year as it brought in several new and renewing KFTC members and raised more than $2200 to support KFTC's work. 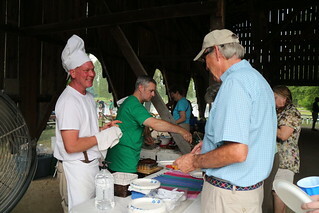 To see more great pictures of the Barn Bash, check out this album on flickr. Members now have their sights set on doing good local Voter Empowerment work this fall. Wilderness Trace will have its first-ever local voter guide, surveying candidates for Danville City Commission and Mayor, and Boyle County Fiscal Court. Chapter members will also be out registering voters at a number of upcoming community events. 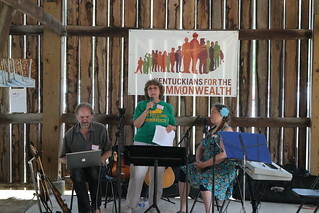 To learn more about how you can get involved in this work, please contact KFTC Organizer, Beth Bissmeyer, at (859) 314-2044 or bethbissmeyer@kftc.org.